Should Your Organization Employ Voice AI or Chat Bots? 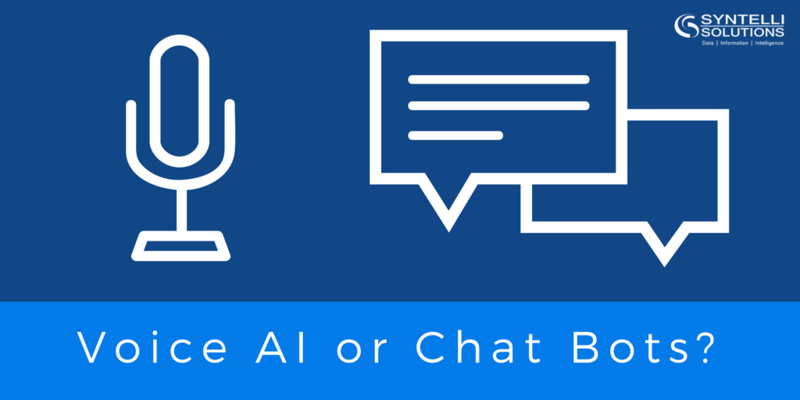 Should Your Organization Use Voice AI or Chat Bots? Voice AI or Chat Bots was the subject of a very interesting dinner conversation recently! While significant cost efficiencies, particularly in call centers, will be driven by voice driven AI, chat driven AI should not be written off easily. The demographic trends clearly indicate that the percentage off ‘chat happy’ population is increasing while the ‘phone happy’ population is slowing and will continue to see decline. I believe that every company should make an effort to lead customers towards chat for initial contact and initial conversation. Company should make every effort to validate the customer and have the customer define the problem before allowing a phone call to happen. Think about contact centers that receive millions of calls, moving just about 5% or 10% of the calls to chat bots will save millions of dollars if just a few minutes can be shaved off the initial conversation with the customer. Using Facebook Messenger as Chat Bot, right off the bat, we will know who your customer is, and you will have access to a some demographic and validated information about the customer. Several minutes can be saved just by knowing basic information about the customer even before the conversation begins. Not only a is chat bot environment non-intrusive, it offers the convenience to the customer to pause the conversation at any point and pick it up at the same point several hours later. Think about a customer who is sitting in doctors waiting room and initiates a conversation about a broken dishwasher. There is no immediacy of finishing the conversation right there or risk re-starting the conversation later in the evening and start by re-validating the same information about your name, your phone number and address! The customer can carry the conversation to a certain point take a pause and restart when she gets back home. From the company’s perspective, it is so much easier to escalate the issue, give personalized attention to the issue. If the company can demonstrate genuine interest in solving the problem, the customers will wait for a couple of hours for you to get back – but again, the customer is not waiting on the phone, they are just waiting for the chat message to come back and they can re-engage. Not only this, the Facebook messenger will keep history of the conversation which is auditable and both the customer and provider will have full transparency in the conversation. Nothing is lost in translation, you will have access to exactly what the customer said, oops typed. For issues that take several touch-points with the customer, this benefit itself trumps all other reasons. What about pictures? In a customer services environment, customer can attach pictures or video of the broken dishwasher and post them in the chat message in real time or in an off-line mode and the history will be maintained. The same is true for invoices/receipts or any other documents that the customer has to present to the company. There ain’t anybody who will miss the wait music! The scalability of chat-bots will beat the slow response of chat windows and voice call centers. The biggest advantage for you, as a company, is that you have an excellent opportunity to build a relationship with the customer. Escalations to tier two and tier three support can be seamless for the customer and is again, not forcing the customer to stay with you over the phone while background research is done. For a company, this kind of relationship and data is a treasure trove. This perfectly fits the classical ‘Digital Transformation is a Three Letter Word’ paradigm and can be mined to design and build better product, target the customers better and keep the customer for life, because it helps you build a relationship. Chat Bots offer similar advantages in a healthcare scenario. A health insurance company that receives, say six million calls every year, perhaps has 50% of the calls from the same customer two or three times over. The payor can get significant time-saving juts in terms of authenticating the customer. A provider can build a deeper relationship with the customer by providing reminders for medication, allow the patient to inform/update the care provider of the symptoms in the middle of the night, thus building a holistic picture of the patient and disease and eventually driving better outcomes!